Home Tags Articles tagged with "Leading Edge Academy"
Leading Edge Academy Maricopa hosted their annual school-wide Spelling Bee. 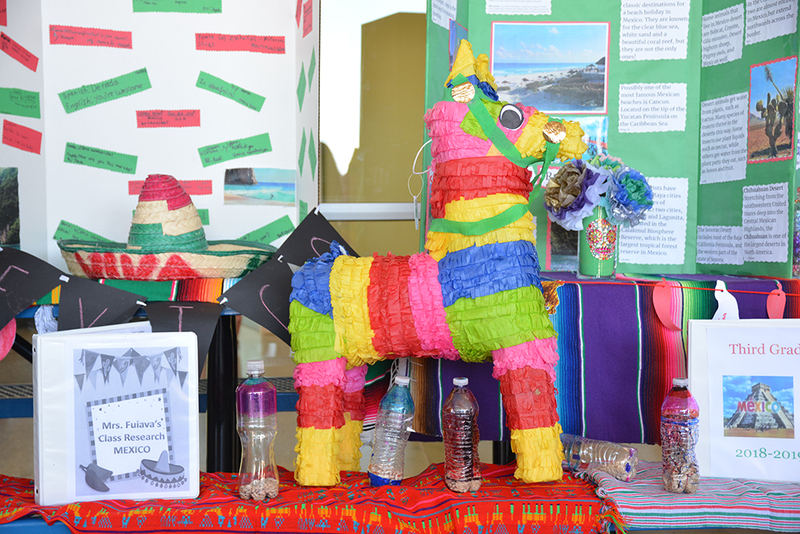 First place winner was seventh-grade student Delia Koschman. Placing second was seventh-grader Sam Ferguson. 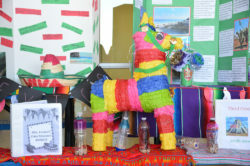 Third place went to sixth-grader Mikayla Pearson. The two runners-up were fourth-grader Xavier Pulido and eighth-grader Ayla McKee. Delia, Xavier and Sam represented Leading Edge Maricopa at the Pinal County Spelling Bee Feb. 15. 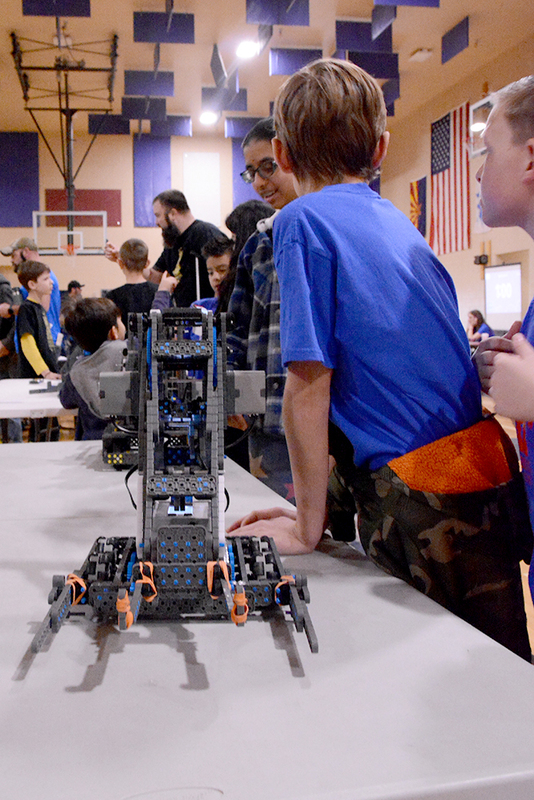 Maricopa teams swept the top five spots in a robotics competition over the weekend. Legacy Traditional School hosted a Vex IQ Challenge Saturday with 11 schools and organizations from around the state competing. Legacy itself had five teams competing and took first and second place with the Copper Bots and Cyber Cubs. 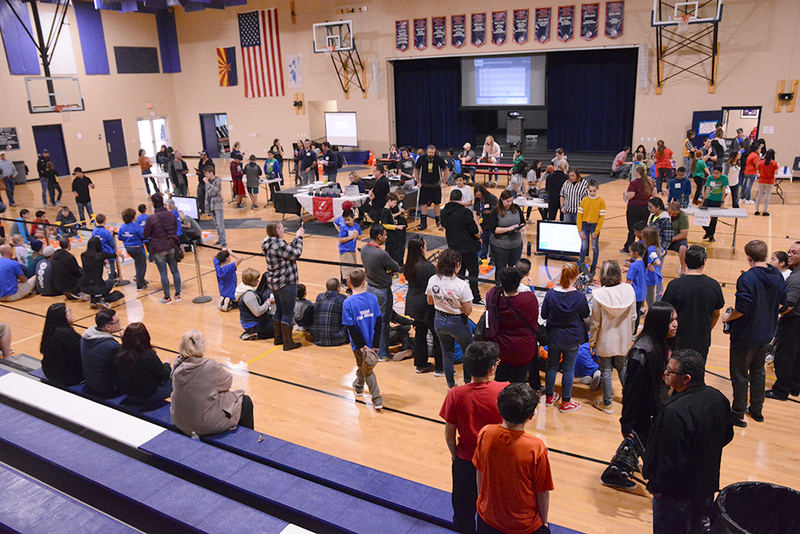 Maricopa’s Samurai Bots finished third while Rocking Robots Are Backs was fourth and the Gray Wolves from Leading Edge Academy were fifth. The Copper Bots not only had the top skills score, earning the Robot Skills Champion award, but also won the design award and the Middle School Excellence award. Rocking Robots Are Back won the Elementary School Excellence award and the STEM Research Project award. 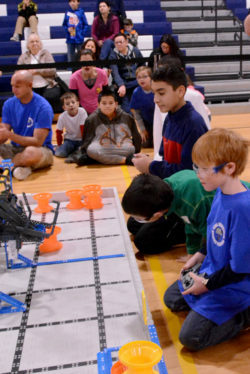 Legacy’s Biggy Backpack Bots won a Teamwork Champion award. 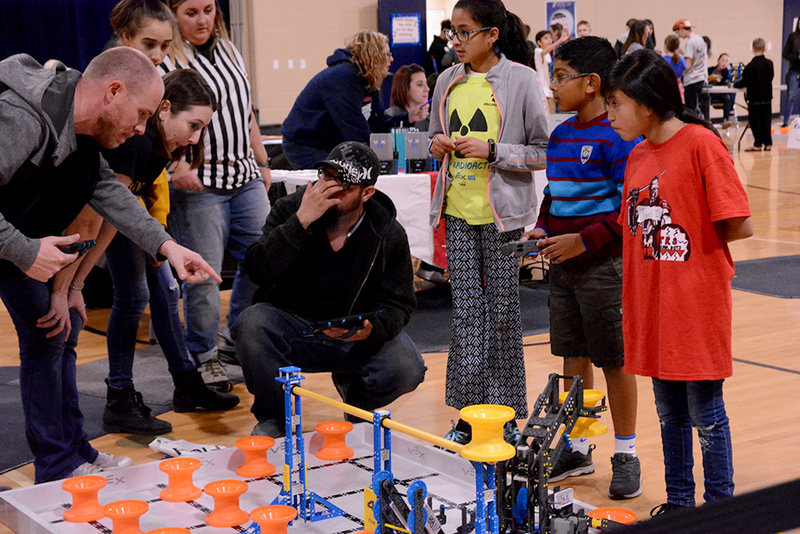 The Maricopa teams of Rocking Robots Are Back, Hazard Bots, Samurai Bots and Cyber Cubs are set to compete Feb. 23 in the Arizona VEX IQ Elementary School State Championship in Goodyear. 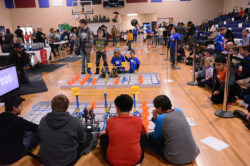 The middle school state championships are March 9 in Chandler. 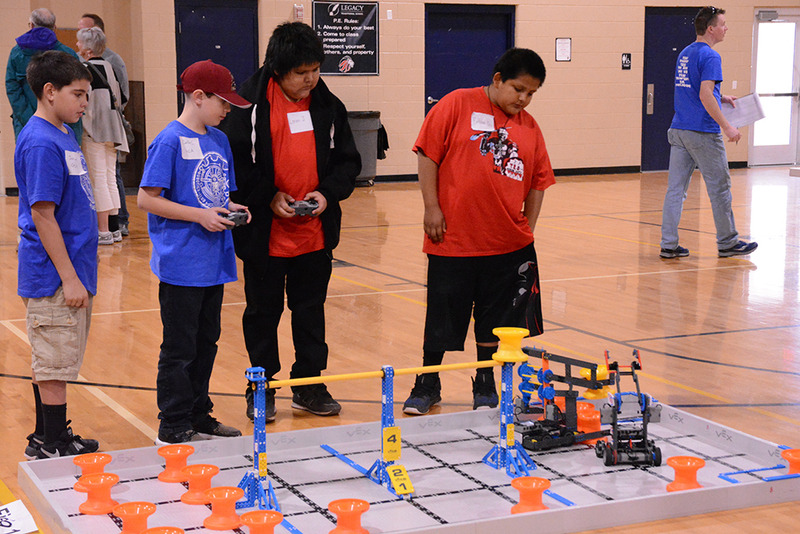 Legacy’s Copper Bots, Biggy Backpack Bots and A-VEX-engers and Leading Edge’s Gray Wolves are all set to compete. Leading Edge Academy hosted a Diversity Fair on Friday that celebrated the many world cultures that make up the United States. 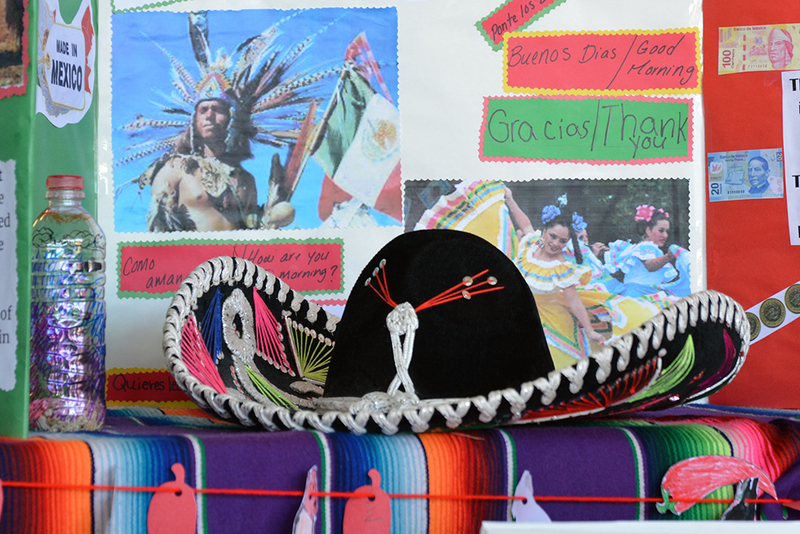 There was music, dancing, poetry, displays and food. 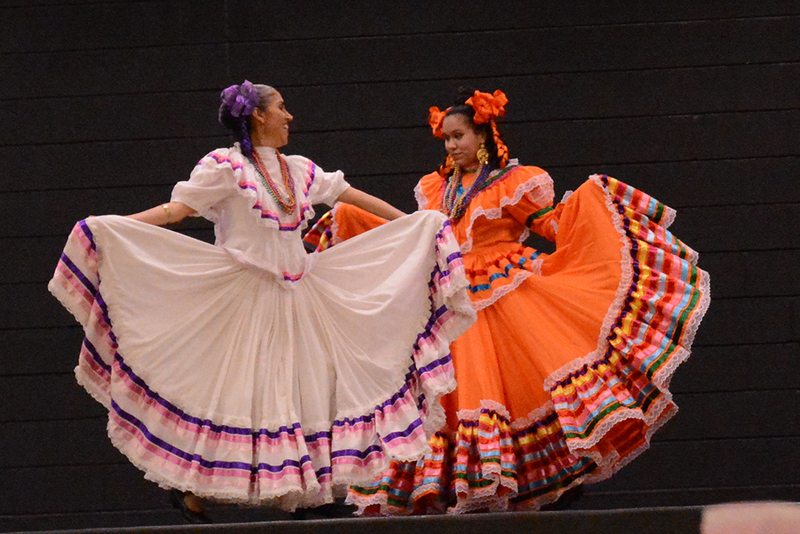 Ak-Chin Chairman Robert Miguel drew children from his daughter’s class as well as Principal Mat Reese and Assistant Principal Rachele Reese into a social dance. Other brought examples of clothes, musical instruments and other items from around the globe. Leading Edge Academy Maricopa placed third at the recent Canyon Athletic Association (CAA) State Wrestling meet. Seven of 11 members of the Leading Edge team qualified for the state tournament Jan. 26. 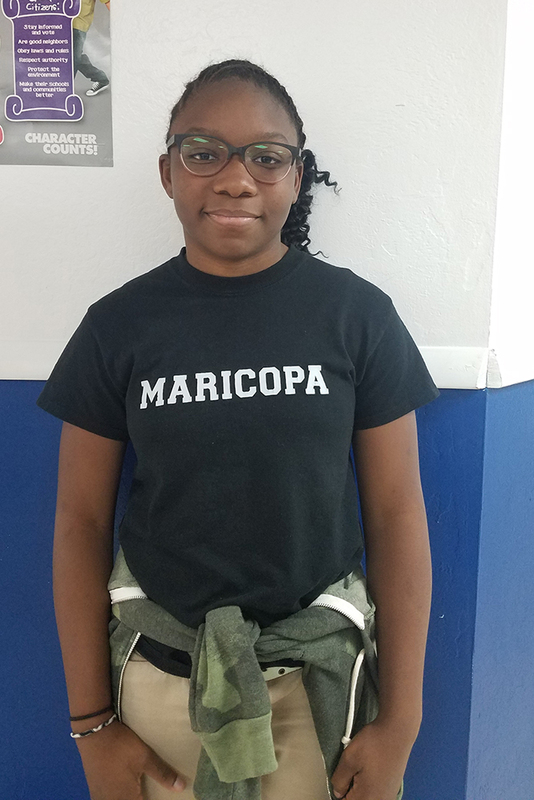 Nia Lewis, a seventh grader in the 136-pound weight class, placed fourth after working her way through a competitive bracket and beating opponents she had lost to earlier in the season. Nia has always had the option to wrestle in the girls’ division at tournaments, but given the lack of competition, she opts to wrestle with the boys. Lee Kondravy, a sixth grader, placed third in the 152-pound weight class, taking home the bronze medal. Lee is the brother of last year’s CAA state champion, Zach Kondravy, now wrestling for Maricopa High School. Zeke Buboltz, a seventh grade at 98 pounds, fought a season-long knee injury and made it deep in to his bracket, wrestling with tenacity. “The season started in late November, and the team practiced with Sequoia Pathway, which expanded our wrestler’s repertoire and gave them more diverse competition,” said Leading Edge head coach James Larson. “Pathway coach George Husick is tremendous and welcomed our team onto his mat with open arms. By the end of the season, it felt like we had one team rather than two. We attended numerous meets and tournaments throughout the season, celebrating our strengths and identifying our weaknesses with each match. 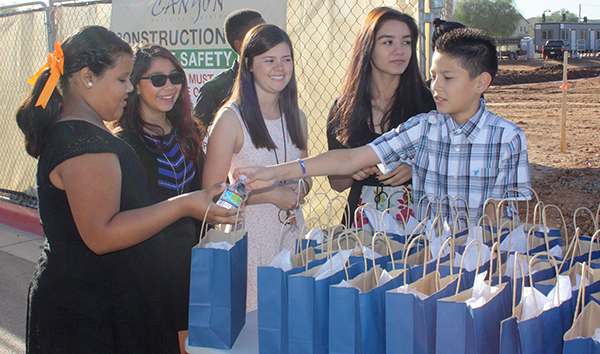 Back to School: What’s new on Maricopa campuses? 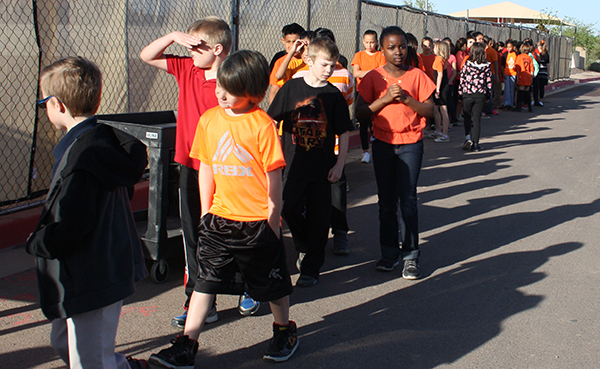 Most children in Maricopa schools will return to class sooner than usual this year. The Maricopa Unified School District approved a calendar change that will send students back to campus July 23. The first day of school for charters Sequoia Pathway Academy and Legacy Traditional School will also be July 23. Leading Edge Academy begins Aug. 6. 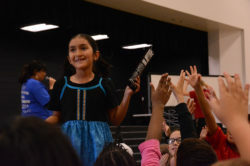 Along with adopting a new calendar that will give students two weeks off each in the fall, winter and spring, the district this year will also implement a new English Language Arts curriculum in each of its nine schools. The district’s only high school welcomes 20 new teachers to campus, along with Principal Brian Winter and Assistant Principal Michelle Poppen. MHS offers three new courses: Anatomy and physiology, statistics and probability, and an intervention program for algebra 1. New Athletic Director Jake Neill, who oversees sports for the entire district, will help introduce swimming as a fall sport at MHS. The high school’s credit recovery program, Ram Academy, begins its second year of instruction. Jason Szoltysik is the junior high’s new assistant principal. “He brings many years of educational experience, and he is going to be great for our students and overall campus,” said Principal Thad Miller. Designated as a “Leader in Me” Lighthouse school this spring, MES adds four new classrooms, which is expected to decrease class sizes. 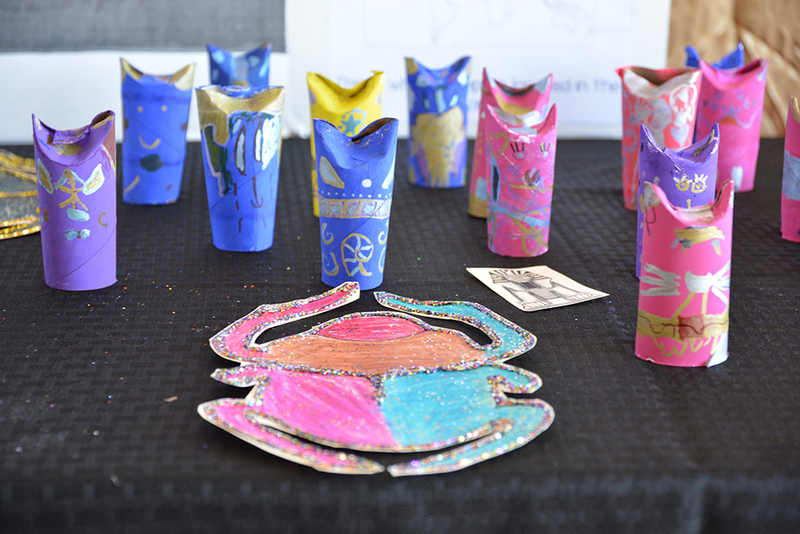 The majority of teaching staff returns, and its administrators are hoping veteran educators will help newer teachers implement the “7 habits of highly effective people” and Leader in Me program in each classroom. A number of teachers got a head start this summer training on the materials for the district’s new ELA curriculum, according to Principal Randy Lazar. The school adds a new second grade teacher, a Title 1 paraprofessional and an academic coach. Pima Butte will share Teacher on Special Assignment Elizabeth Allison with Santa Rosa Elementary. The grade school follows Butterfield’s lead in implementing the PBIS discipline program. “The goal of PBIS implementation is explicitly teaching behavioral expectations and rewarding students for following them,” said Principal Eva Safranek. Santa Rosa welcomes back the WATCH D.O.G.S. program for the second year. 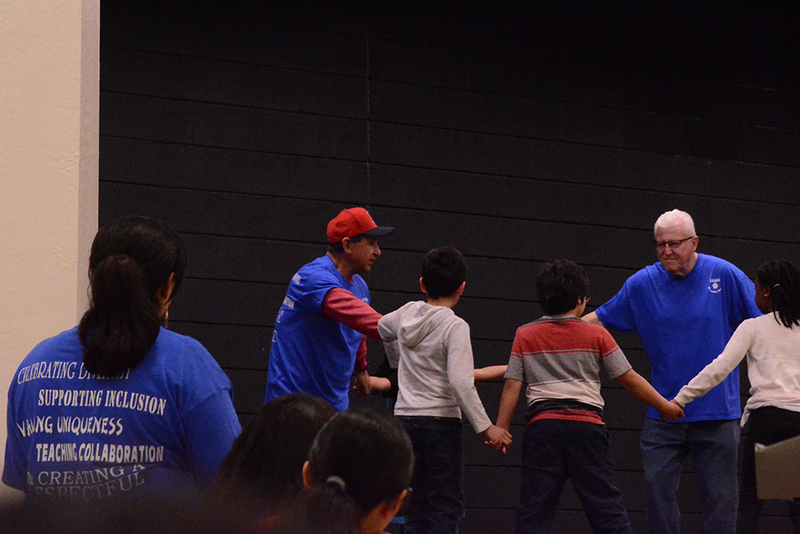 The Dads of Great Students initiative provides fathers opportunities to be involved in their children’s education. NOTE: Ram Academy, Desert Wind Middle School, Saddleback Elementary and Santa Cruz Elementary did not submit school updates. 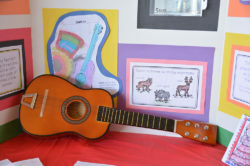 Expected to reach full capacity, LEA and its 815 students welcome a new music teacher from Maryland, a full-time math coach and a new special education teacher. The elementary adds additional recess time for students in kindergarten through fifth grade with a new shade overhang on the playground. A supplemental K-2 math program and an expanded technology program will also be implemented. NOTE: Sequoia Pathway Academy, Legacy Traditional School, Camino Montessori and Holsteiner Agricultural School did not submit school updates. At least two charter schools in Maricopa will be closed Thursday for a planned #RedForEd teacher walkout. Sequoia Pathway Academy Campus Director Alfonso F. Alva said Monday the school will be closed Thursday and Friday. That makes SPA one of eight EdKey schools planning to close for the walkout. 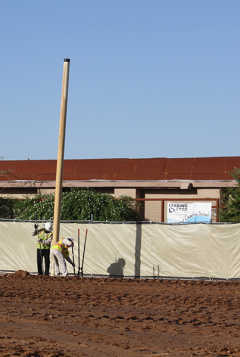 The Maricopa campus was already scheduled to be closed Friday. Late Tuesday, Leading Edge Academy told parents the school would close Thursday and Friday, a decision based on the number of teachers and staff indicating they would not be at school. Legacy Traditional School, another large charter, is currently slated to be open. Statewide, educators have called for a work stoppage to bring awareness to the issues of teacher pay and education funding in Arizona. In a rejection of Gov. Doug Ducey’s proposal for what is being described as a 20-percent raise by 2020, a majority of teachers voted last week to walkout April 26. 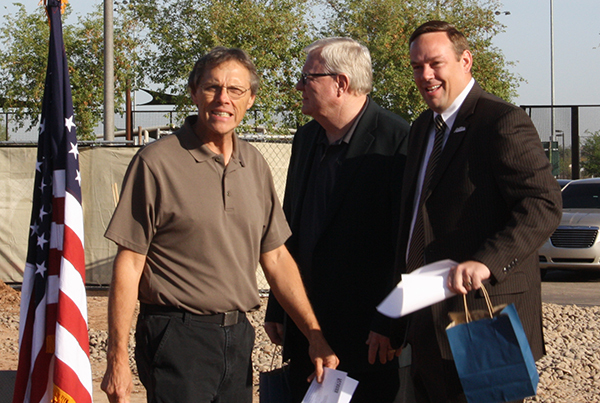 The effort is being organized by Arizona Education Association, Arizona Educators United and other teachers. The duration of the walkout has not been determined. Neighboring districts in Stanfield and Mobile both intend to stay open. Monday, Stanfield Superintendent Melissa Sadorf posted an announcement to parents explaining a full schedule Thursday and early release Friday. 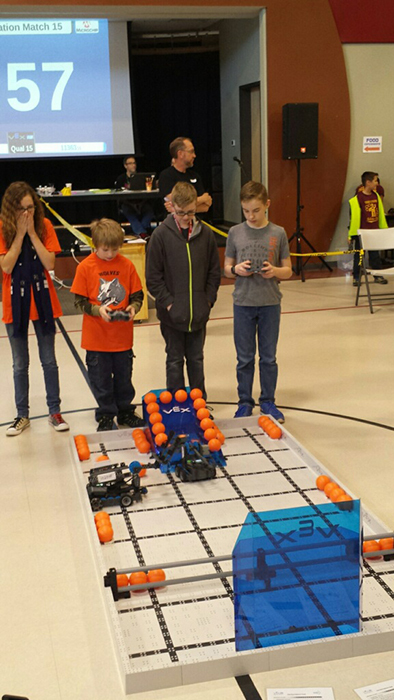 Leading Edge Academy Maricopa robotics team, the Gray Wolves, qualified for the 2018 State Championship at the Vex IQ Challenge tournament in Queen Creek on Feb. 3. The Gray Wolves dominated their finals match with their Division 1 team partner, the Skittlers, with a collective score of 155 points, overtaking the favored teams. Together they earned the Teamwork Champion Award. 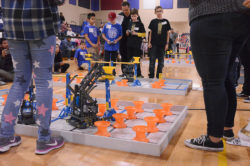 LEA Maricopa had four middle school robotics teams attend this final qualifying event for the 2017-18 season, and three of them made it to the final round. With this award, the Gray Wolves are the first robotics team from LEA Maricopa to qualify for the VEX IQ State Championship. 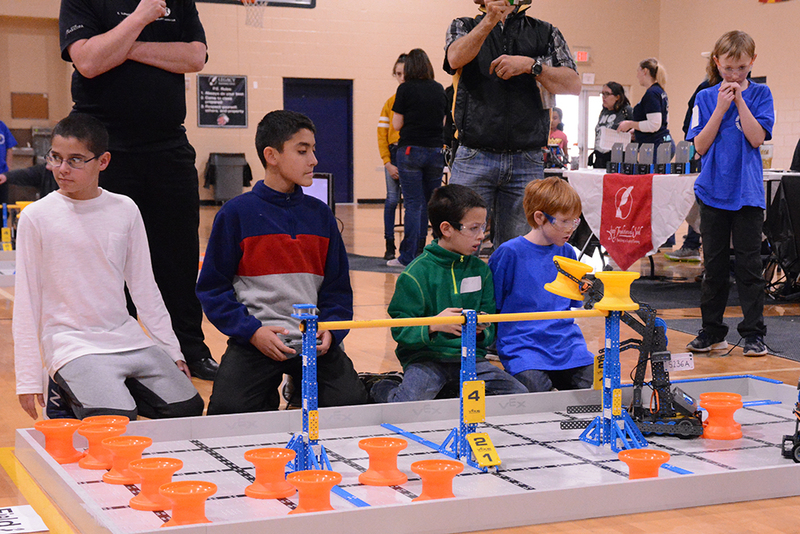 The state championship will take place on Saturday, March 3, at Microchip in Chandler. For more information, visit www.robotevents.com. Leading Edge Academy Maricopa eighth grader Zach Kondravy won the state title at the Canyon Athletic Association’s Junior High State Wrestling Championship on Jan. 27. Zach is the team captain of the first Leading Edge Academy Maricopa wrestling team. He was 20-0 for the inaugural 2017-2018 wrestling season. 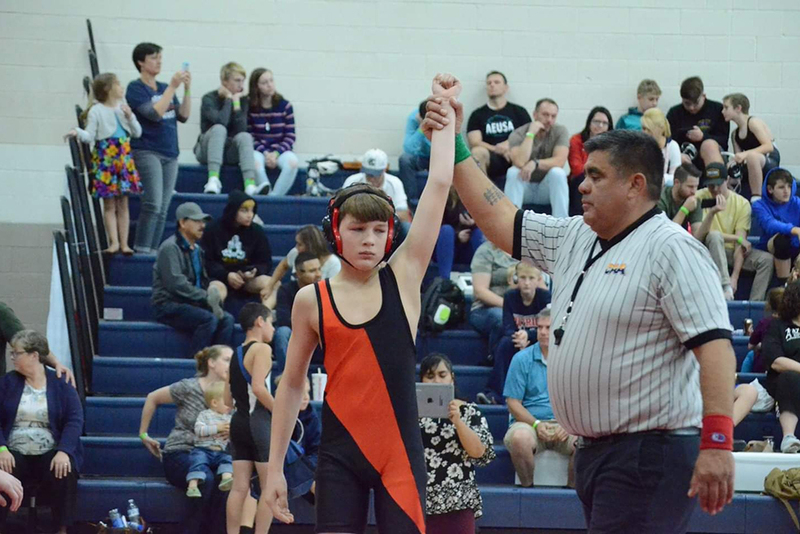 Finishing first at the CAA Junior High ALA Warrior Classic on Dec. 2 and again at the CAA Junior High ALA Gilbert Eagles Classic on Jan. 13, Zach progressed to the ultimate first place finish in the CAA Junior High State Championships. 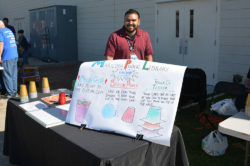 A longtime employee of Leading Edge Academy in Maricopa was recently awarded “Elementary Teacher of the Year” out of six campuses in the charter school district. 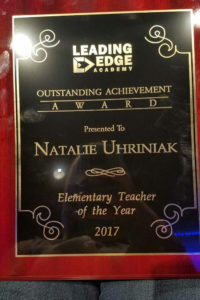 Third grade teacher Natalie Uhriniak said she did not expect to hear her name called during an awards ceremony at a district gathering over the summer. “I was completely taken by surprise, I had no clue that I was even nominated,” Uhriniak said. However, her designation comes as no shock to school administration. “She leads by example and she has high expectations for her students,” Principal Mat Reese said. 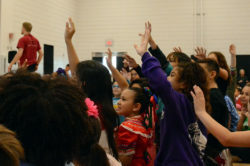 For the past five years, Reese said, Uhriniak’s students have led the school in math and reading scores on state exams. Uhriniak began her teaching career at the Mountain View campus in Queen Creek 10 years ago where Reese was the principal at the time. “I knew that she was going to come in to her new job and work hard to be successful and I always put her in a position that would be successful,” Reese said. She followed Reese to the Maricopa campus a few years later. As a teenager, Uhriniak worked as a swim coach and instructor. Reese said he saw a character trait indicative of that kind of athlete during their first interview. “Swimmers need to get up at 4 a.m. and go to the pool. I knew she had something I wanted: Work ethic,” Reese said. Watching children progress through the swim season and through the school year is what Uhriniak said has always inspired her most. Uhriniak was nominated for teacher of the year by her peers and a district committee made the selection. “I felt humble that after all these years I was being recognized and after all that hard work, dedication, and hours spent after school and before school was finally being looked at,” she said. 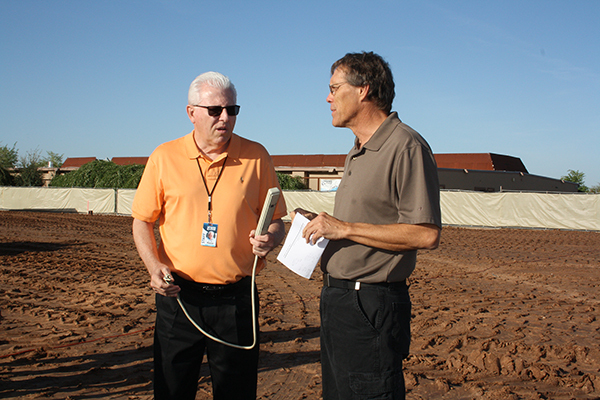 Mat Reese has a long history in Maricopa, having taught and coached many students here for 30 years. 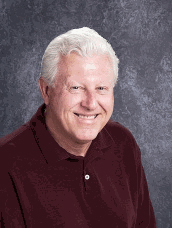 Now he is the principal of the charter school Leading Edge Academy and its director of education. Quote: Don’t tell me how good you are, show me. Words to live by: Good character goes a long ways. 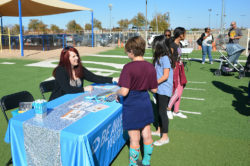 In six years, Leading Edge Academy’s presence in Maricopa grew from a trailer, where Principal Mat Reese interviewed parents of prospective students, to a 430-student charter school. “We’ve seen it grow, and we kept thinking, ‘Are they going to expand? Classrooms are getting kind of tight,’” said Heli Tanon, who placed two children in the school. One has now moved on to high school and the other is in fourth grade. 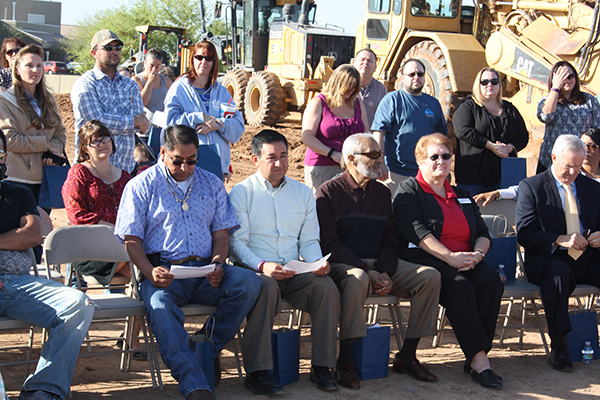 Tuesday morning, LEA broke ground for the much-anticipated expansion. 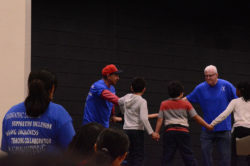 LEA founder Delmer Geesey was on hand along with Mayor Christian Price, members of the city council, county Supervisor Anthony Smith, Ak-Chin Chairman Robert Miguel, members of the Ak-Chin tribal council and some parents. 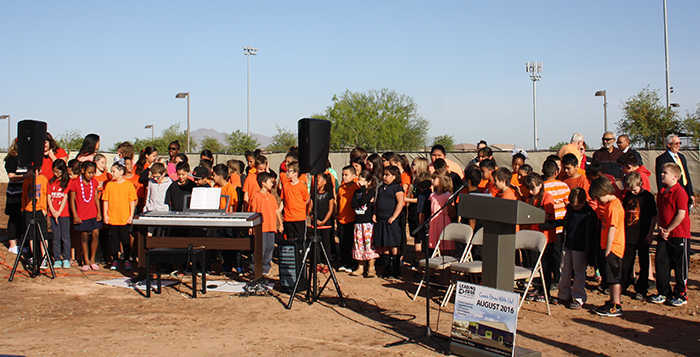 A school choir performed the national anthem. 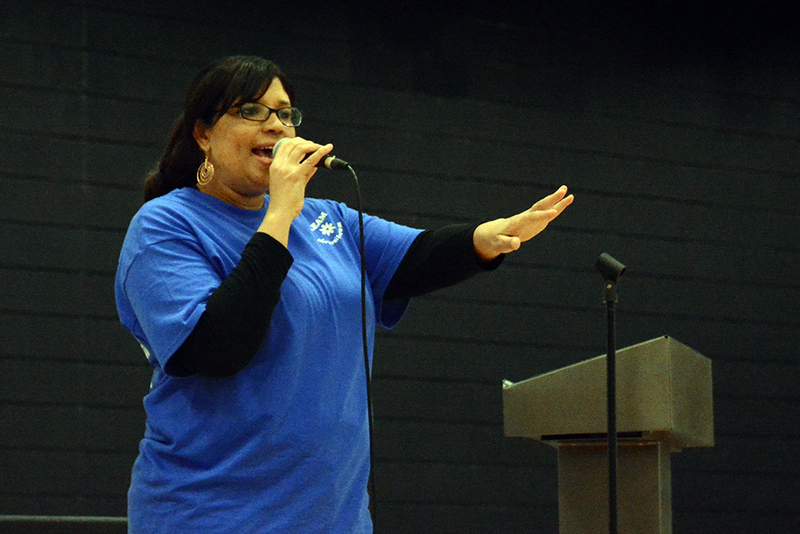 “It’s nice to see everybody come together and support the school,” parent Nicolle Tanon said. The expansion at the northwest corner of Porter Road and Adam’s Way came about after Community of Hope Church sold its parcels on the site to Leading Edge. From there, things moved quickly. “I went on spring break and came back and suddenly all the fencing was up,” Reese said. 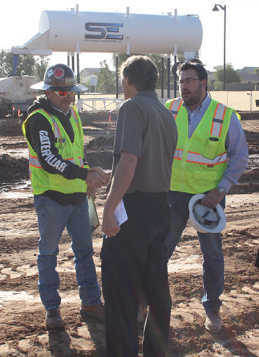 The 28,500-square-foot expansion provides space for up to 450 more students. 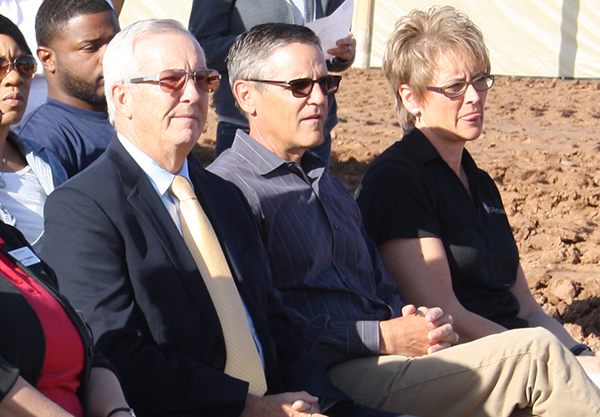 Reese said it will include 18 classrooms, a gymnasium and office space. Completion is planned for August. Price called Leading Edge a “great partner” with the city. 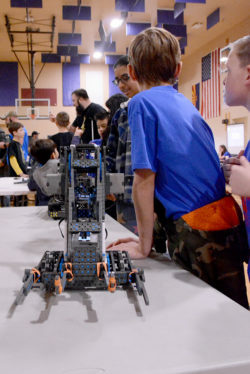 Maricopa kids know their Vex IQ Robotics. 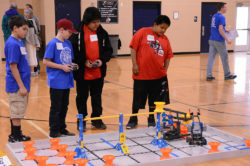 Students from four local district, charter and home schools qualified for the Feb. 27 state tournament at Microchip Technology Inc. in Chandler. For the Pima Butte Robotics team, it will be the second state competition in a row. 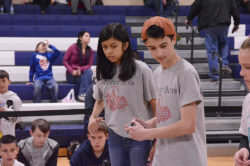 “This year, we actually had three separate teams building robots, and two of the three teams have qualified for state,” assistant coach Michael Gray said. 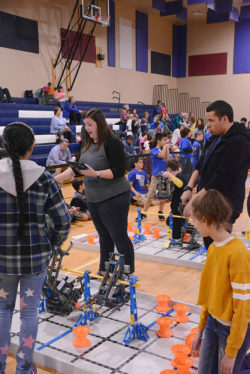 Santa Cruz Elementary, also in the Maricopa Unified School District, qualified a team, as did the charter school Leading Edge Academy and the Maricopa Homeschoolers. 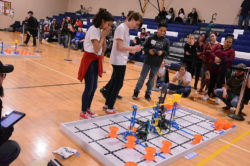 The Homeschoolers, whose team name is Light Signal, are the only Maricopa middle school team to reach the state competition. They will compete against 12 other schools. Leading Edge has had three teams place in February competitions, and it was the fifth-grade team that qualified for state. 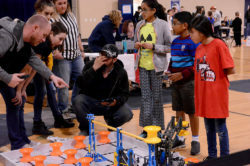 They were fourth overall at the Sequoia High School Classic, and they took first place and the trophy for programming skills at Imagine Prep Superstition. 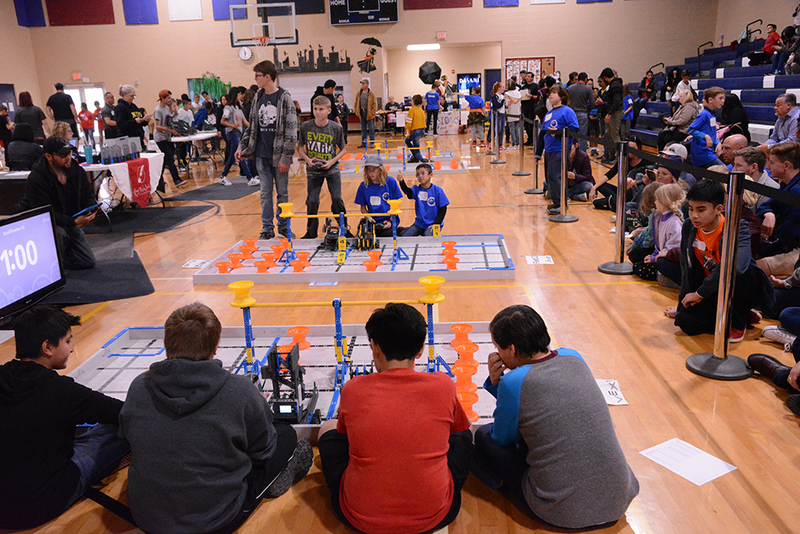 The MUSD and Leading Edge teams are sponsored by the Ak-Chin STEAM Foundation. 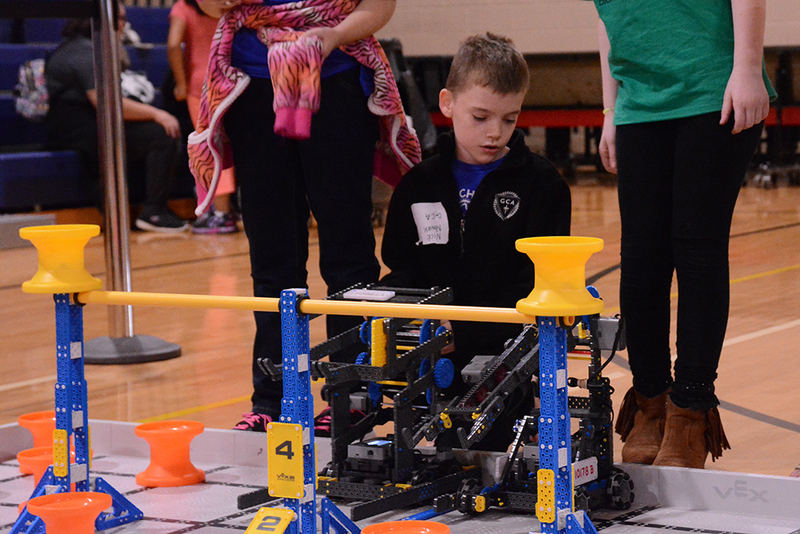 There are 18 teams competing in the elementary division. At the state tournament, six teams can earn a spot in the World Championships in Louisville, Kentucky. 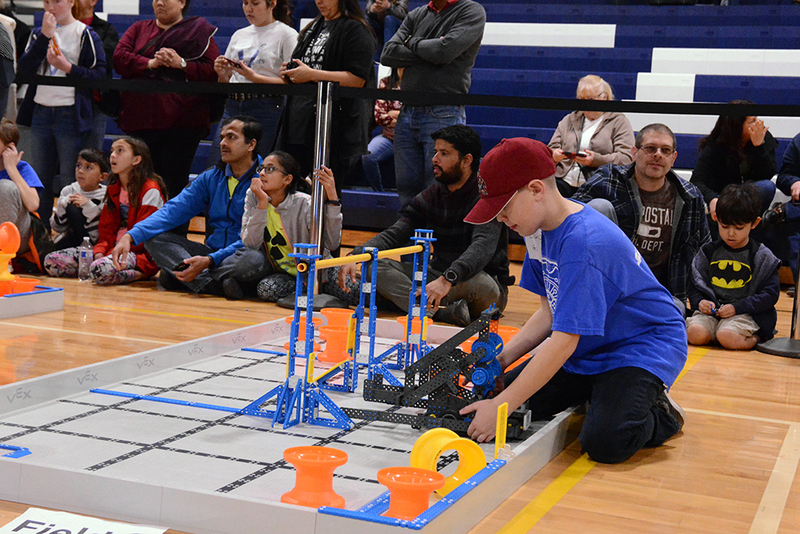 The winners of the following awards will automatically advance: Middle School Excellence, Teamwork Champions (two), Design Champion, Programming Skills Champion and Robot Skills Champion. Matches start at 10:30 a.m. Microchip is at 2355 W. Chandler Blvd. Community of Hope Church needs a home of its own. Our Lady of Grace Catholic Church needs to do something with its current church as it prepares to move into new digs. Leading Edge Academy needs to expand. All of these needs may have been met with a quick series of transactions in December. “Our Lady of Grace has been really, really generous in working with us really, really quickly,” said Rusty Akers, pastor of Community of Hope Church. “We’ve been in real estate, and it just doesn’t happen this fast. 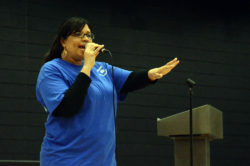 Community of Hope holds its services in the Leading Edge Academy on Adam’s Way. 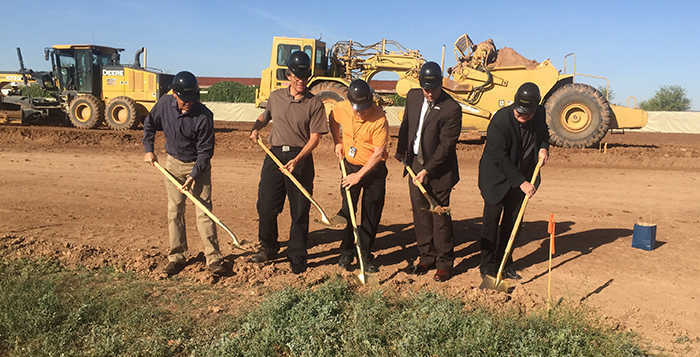 The church also owned two acres, which it had planned to use to build its own facility. In January 2014, it had a capital campaign to raise funds for that new building. Akers said Community of Hope had been in talks with Leading Edge to split its acreage because both entities needed more room to accomplish their respective goals. However, the cost of erecting a new building “is still very expensive,” he said. Knowing Leading Edge had plans to repurpose and expand, he was also nervous about the future of his 10-year-old church at the site. At the east end of Adam’s Way, Akers can watch the new Our Lady of Grace church under construction. Our Lady of Grace has held Mass at the Honeycutt Avenue building for decades. But the conversation set the boards of both churches reconsidering. 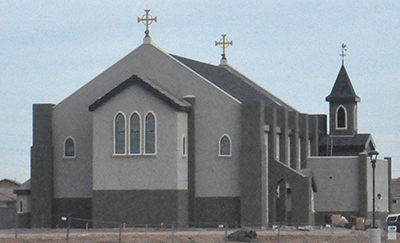 The current Our Lady of Grace church sits on five acres on Honeycutt Avenue across the street from Maricopa High School. The building was constructed 50 years ago and has struggled to accommodate the population growth in the city. It has worked out fast. 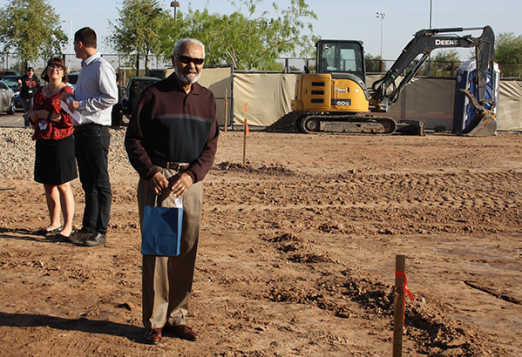 Two days after opening escrow with the charter school to sell the two acres, Community of Hope entered escrow with Our Lady of Grace to buy its five acres. A new church for Our Lady of Grace is under construction. There is no debt attached to the Honeycutt Avenue property. 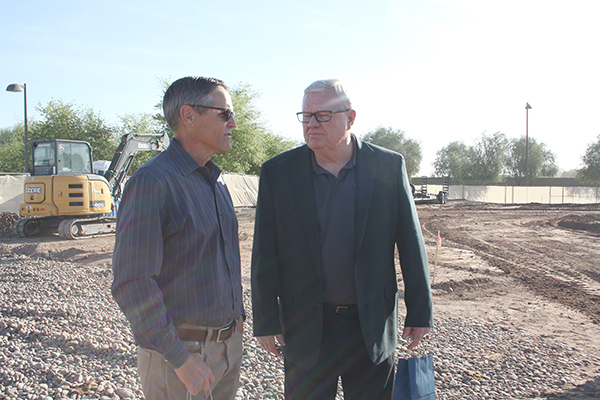 Coutré said the money from the sale of the parcel will probably go to the Tucson Diocese to help pay off the new 38-acre lot and building on Adam’s Way. Akers said the capital already raised will be enhanced with another campaign. He said he expects his congregation to need another $100,000. 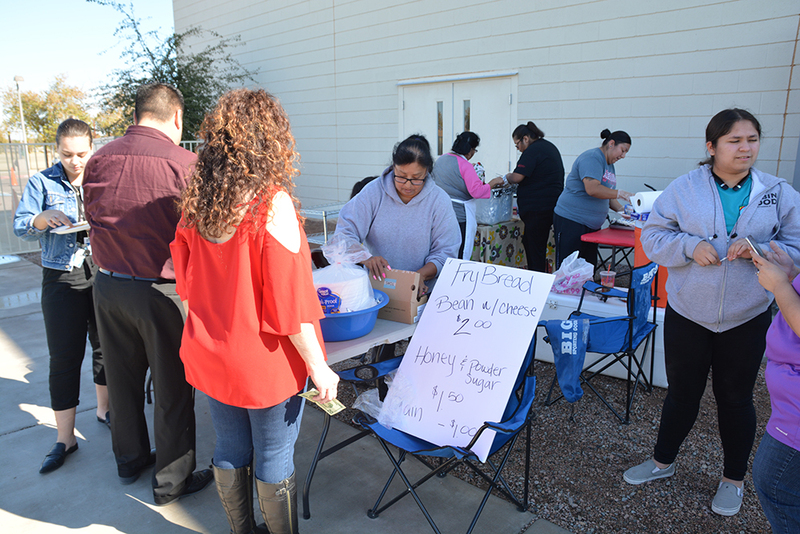 Community of Hope has a membership of around 300, with an average Sunday attendance of 250. The building being purchased is not large. As the church grows, Akers said it would not be difficult to have multiple services. The church is also looking at options for the rest of the five acres. “It will be nice to have a home of our own,” Akers said. Community of Hope will continue to meet at Leading Edge until all paperwork is completed with Our Lady of Grace. Akers estimates the congregation will be able to move to the Honeycutt Avenue building in March or April. This story appeared in the January issue of InMaricopa News with one correction. 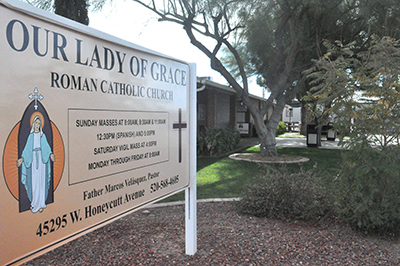 Our Lady of Grace is in the Diocese of Tucson. 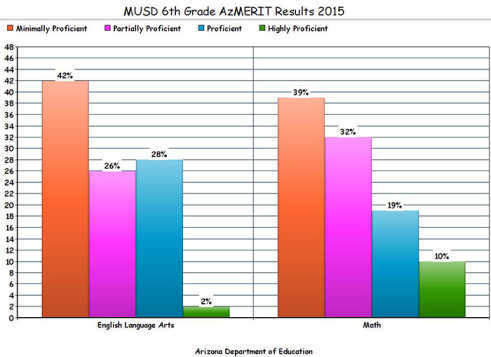 The first test results under AzMERIT, the assessment that replaced AIMS (Arizona’s Instrument to Measure Standards), have some districts and public charter schools in Maricopa looking for ways to improve come spring. Leading Edge Academy Principal Mat Reese said with the test approved late in 2014, schools didn’t have much information on it until January. Students were taking the test three months later. The new test is intended to be taken online. Maricopa Unified School District Superintendent Steve Chestnut said unlike last year when the district didn’t have enough computers to equip all the test-takers, all nine MUSD schools will give the spring assessments online thanks to additional laptop carts and wireless laptops and an enhanced network. Results were mixed across all schools. Legacy Traditional School outscored the state average in every grade while MUSD’s junior highs and high school test-takers struggled. At the 55-student Holsteiner Agricultural School, founder and director Tanya Graysmark wrote in an email that students taking the math test were exhausted after the test and frustrated with the on-and-off-again WiFi. She said the math was presented differently. “We have reviewed the data and will work with students on mastering the skills they are struggling with,” she said. 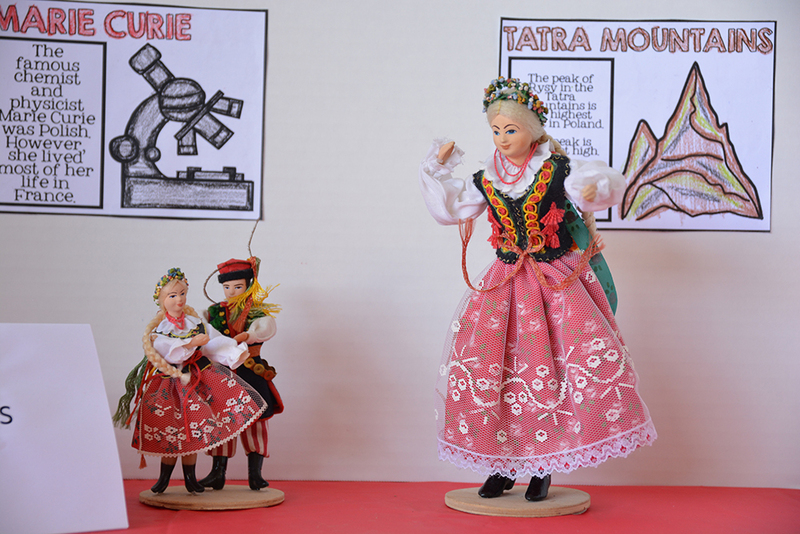 The test is intended to be comparable to the National Assessment of Educational Progress. 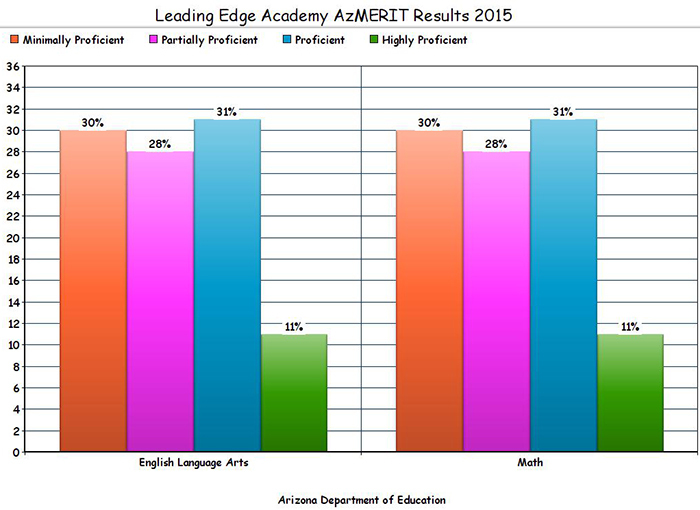 On NAEP and AzMERIT, “proficient” is the second-top scoring category students can achieve. “There were a lot of variables, so hopefully we’re going to be smarter and wiser the next go around,” Reese said. 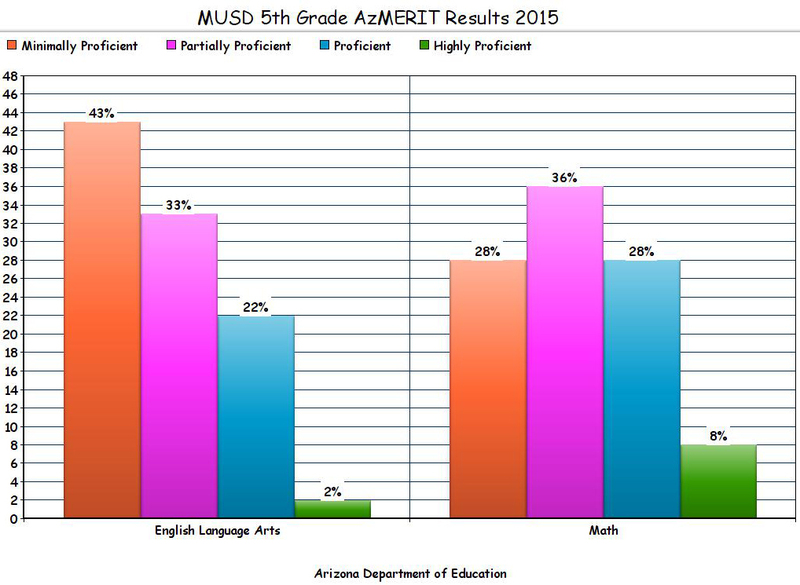 MUSD’s overall student performance on the AzMERIT. See below for grade-by-grade scores: Red=Minimally Proficient; Pink=Partially Proficient; Blue=Proficient; Green=Highly Proficient. The district’s superintendent says the scores on the new test were disappointing. “We had hoped to do better,” Chestnut said. He said there were bright spots in the data. 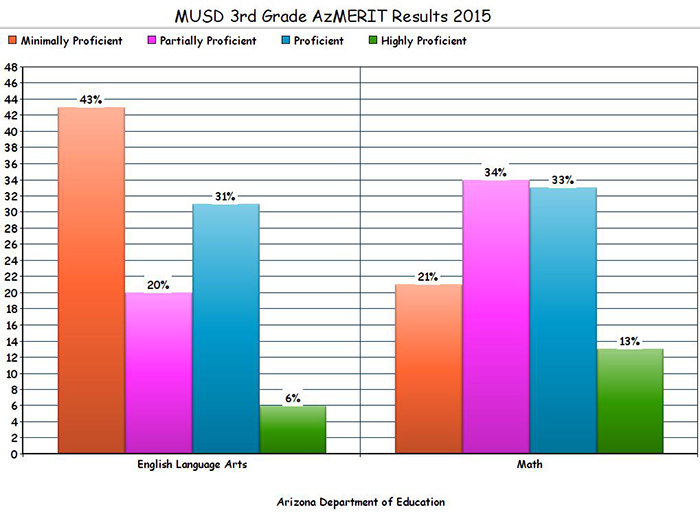 In English language arts, more of MUSD’s fourth graders scored in the proficient category or above compared to NAEP results. By eighth grade, a disparity appears that is even below a state-level comparison. Compared to the rest of the state, fewer of the district’s 10th and 11th graders were proficient or highly proficient in English language arts. “College readiness adds a new wrinkle to that,” Chestnut said of the higher levels of the assessment. “One test doesn’t tell you everything you need to know about a kid’s college readiness,” he said. 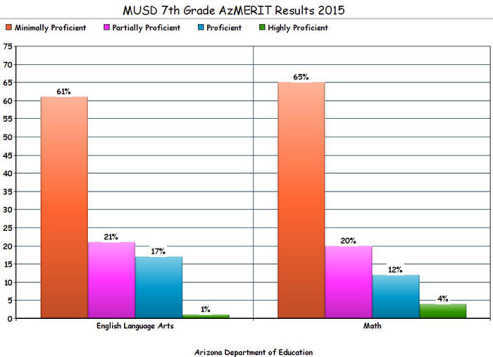 Due to the shorter length of the test, intended to limit the amount of time students spend on assessments, AzMERIT data does not break down results into the same types of strand data that AIMS did. “Another problem is that we don’t get as much detailed information as we did on AIMS,” Chestnut said. 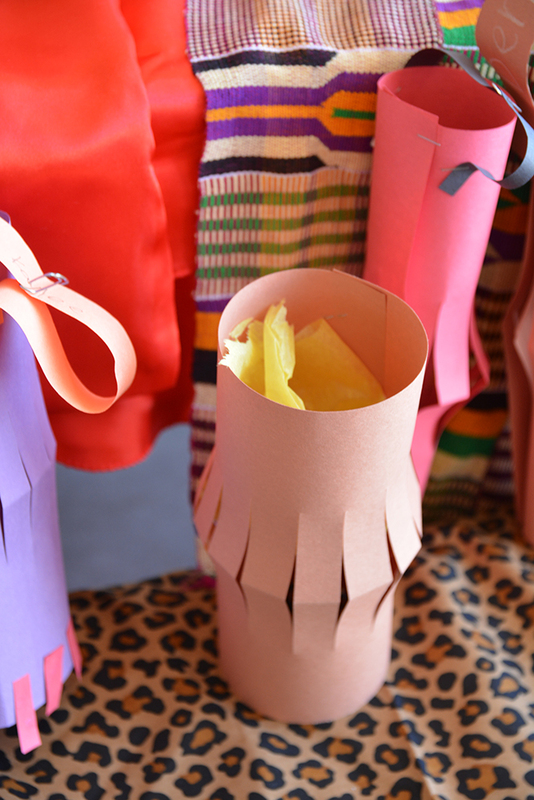 Interpreting the data is a step toward improving classroom instruction. Some districts find this difficult without the in-depth data. Fourth grade math testing results were roughly in line with NAEP, but, again, a disparity appears by eighth grade that also exists compared to state results. 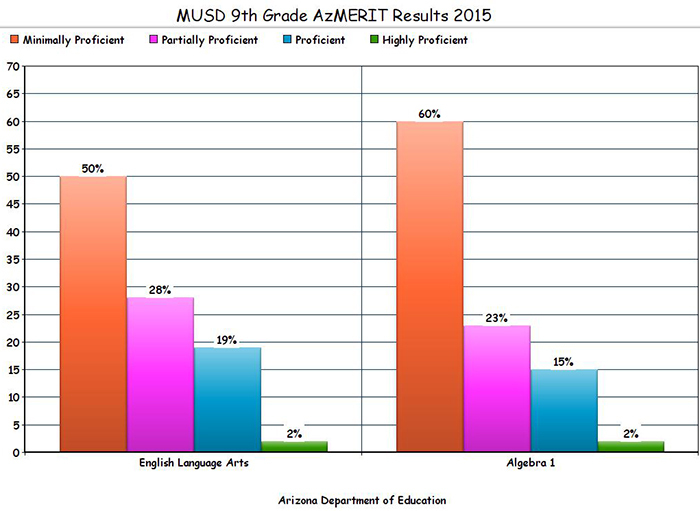 In the highest-level math, Algebra II, 17 percent of Maricopa students scored in the proficient or highly proficient categories compared to 30 percent statewide. One percent of MUSD’s geometry students tested as highly proficient, a category that 2 percent each of the district’s Algebra I and II students qualified for. 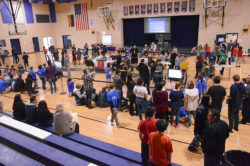 “Parents, particularly high school parents, understand there are a variety of things you have to look at to see if their kid is college ready,” he said. 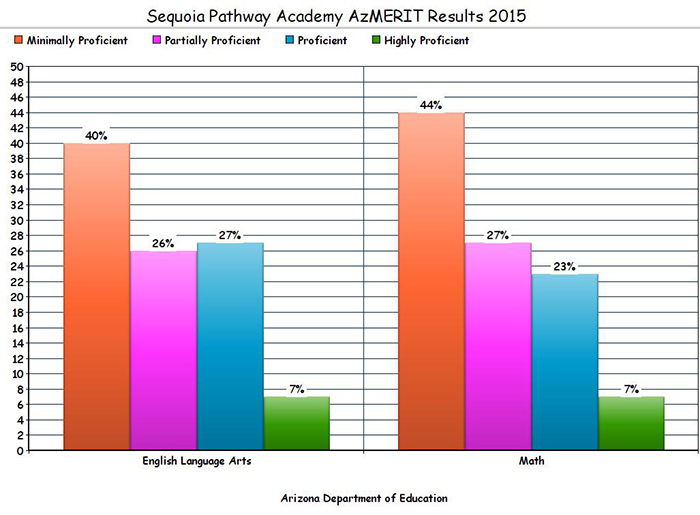 Sequoia Pathway’s AzMERIT results: Red=Minimally Proficient; Pink=Partially Proficient; Blue=Proficient; Green=Highly Proficient. In English language arts, more of the Sequoia Pathway Academy’s third graders were in the highly proficient category than their statewide counterparts. They also fared better on AzMERIT’s math portion. Fourth-grade math students scored roughly in line with their peers who took the state and national assessments. Slightly more language arts test-takers in fourth grade earned passing scores, 45 percent versus 42 percent statewide. On NAEP’s English language arts test, 35 percent of fourth graders scored in the proficient category or better. 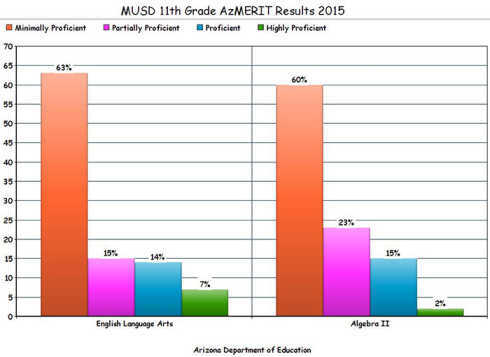 Sequoia’s eighth graders, however, lagged behind their peers at the state and national level with 77 percent failing the AzMERIT language arts section. Statewide, 62 percent did not pass, and on the National Assessment of Educational Progress, 69 percent scored in the basic category or below. More than half of Sequoia’s 11th graders were minimally proficient, roughly in line with statewide results. In eighth grade, however, 86 percent of Sequoia students did not pass the math portion of AzMERIT and 88 percent of algebra II test-takers fell below proficient. None of the school’s students scored highly proficient on either test level. Algebra I students also struggled, with 21 percent earning passing scores compared to 32 percent at the state level. 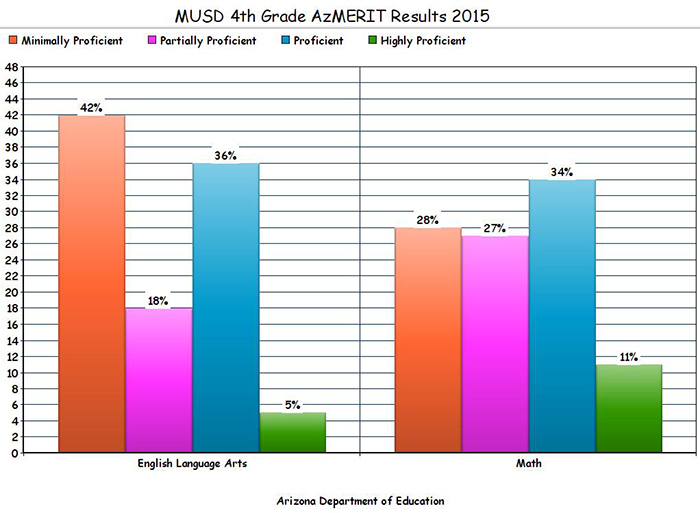 Leading Edge Academy’s AzMERIT results: Red=Minimally Proficient; Pink=Partially Proficient; Blue=Proficient; Green=Highly Proficient. At the K-8 public charter school Leading Edge Academy, 82 percent of its third graders passed AzMERIT’s math assessment, double the state’s 41 percent. Reese said the strong scores on AzMERIT came a year after 94 percent of the school’s third graders “exceeded” in the old assessment’s category. Reese said interventions are in place to help students improve on areas of weakness. More fourth graders (55 percent) passed the test compared to the statewide average (42 percent). Nationally, 39 percent of fourth graders scored proficient or better in math. He said “things get more complicated” as the grade levels advance. Fewer of the school’s sixth graders passed the test compared to statewide numbers. 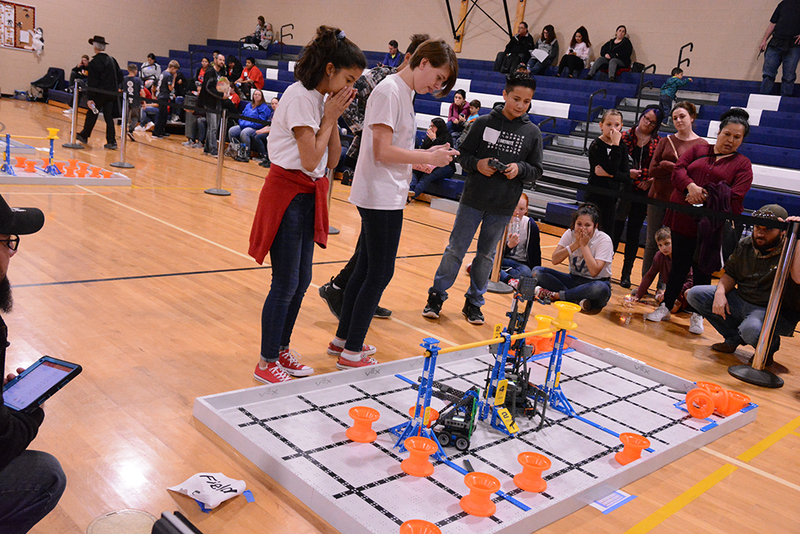 No Leading Edge eighth graders scored “highly proficient” in math, and only 15 percent passed the test, far below the statewide and national averages of 34 and 32, respectively. The school had 75 percent of test-takers qualify as minimally proficient. 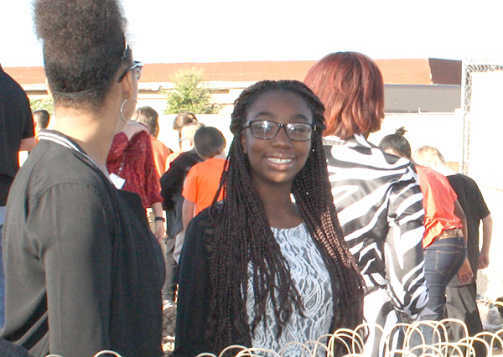 Reese said last year over two dozen students transferred from other schools into the eighth grade, setting up students at varying starting points for the academic year. There were 8 percent more students passing the language arts assessment compared to statewide data. 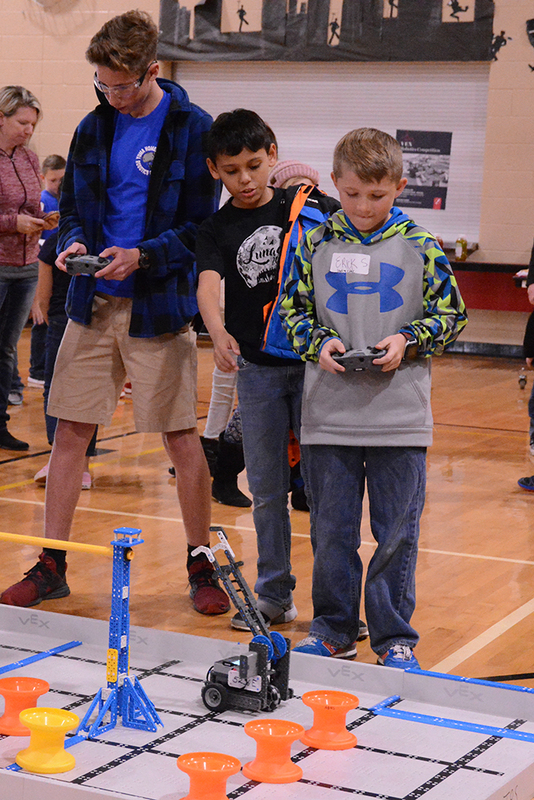 Sixth graders’ scores were more in line with the rest of the state, and more students taking the seventh grade assessment passed compared to their statewide peers. Scores lag among the school’s fifth-grade test-takers, where 81 percent did not pass. In the rest of the state, 67 percent scored below proficient. 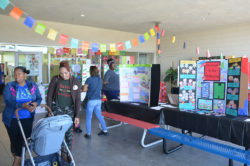 The eighth-grade assessment showed the biggest gap, with 85 percent of Leading Edge Academy’s students not passing, compared to 65 percent statewide and 69 percent nationally. “It is raw scores, and it doesn’t tell the rest of the story,” Reese said. 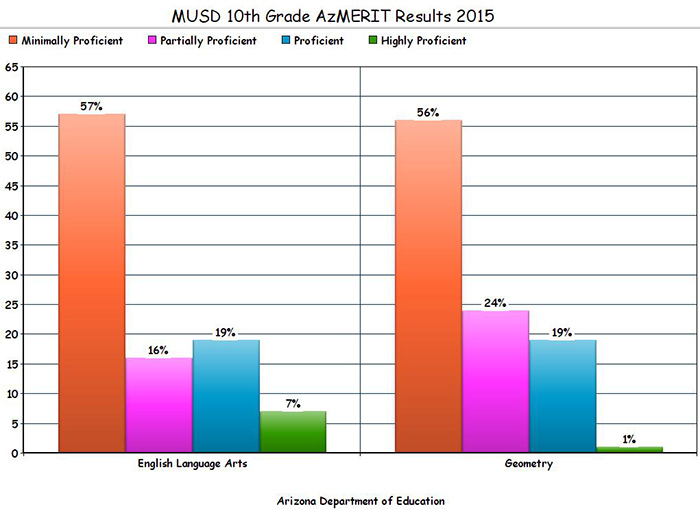 Legacy’s AzMERIT results: Red=Minimally Proficient; Pink=Partially Proficient; Blue=Proficient; Green=Highly Proficient. 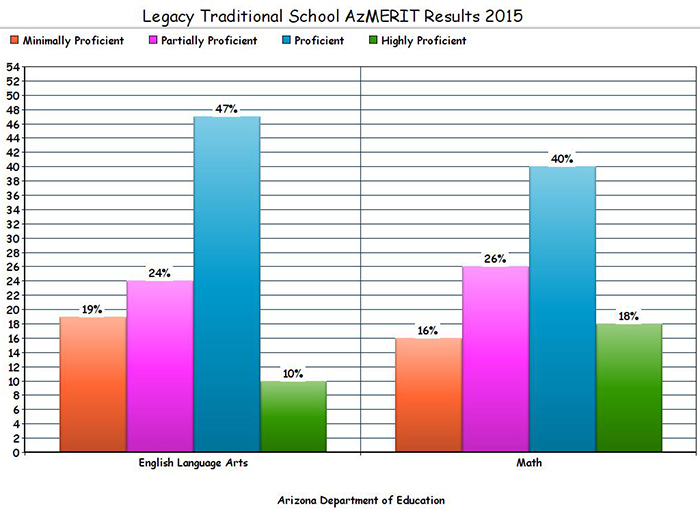 Test takers at the K-10 Legacy Traditional School outscored their statewide peers in every grade level on both the math and English language arts portions of AzMERIT. They also outstripped NAEP scores for fourth and fifth graders. Fifty-seven percent passed the English language arts portion compared to 35 percent statewide. 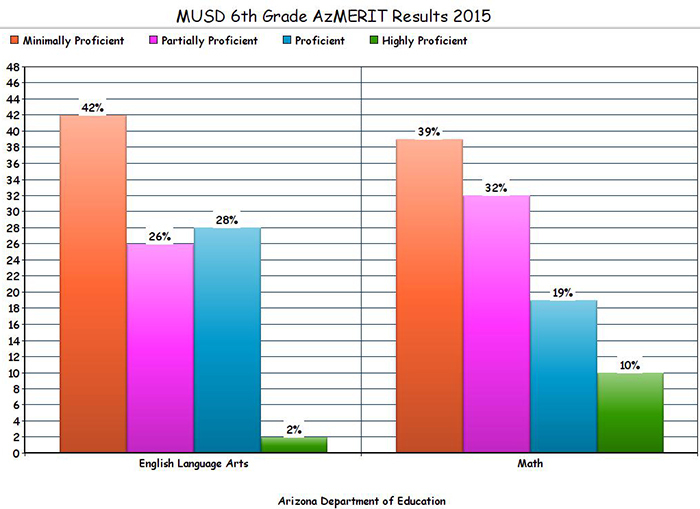 Sixty percent of third graders and sixth graders scored “proficient” or higher. In math, third, fourth and fifth grades did particularly well compared to their peers. More than 50 percent in each grade scored at least proficient. With the state averaging 24 percent proficient in third-grade math, 46 percent of Legacy’s third graders were proficient. Another 17 percent were highly proficient. 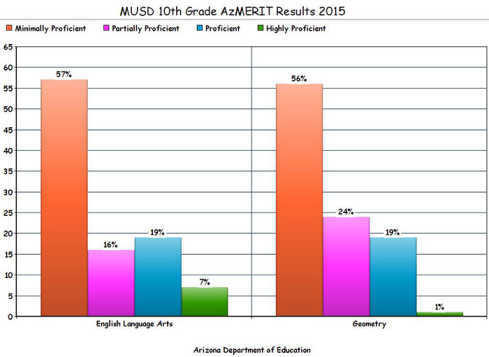 There is more room for improvement in Algebra I. Sixty percent of the Legacy students taking that portion of AzMERIT failed to achieve proficiency. Statewide, 68 percent did not pass. A school official could not be reached for comment. 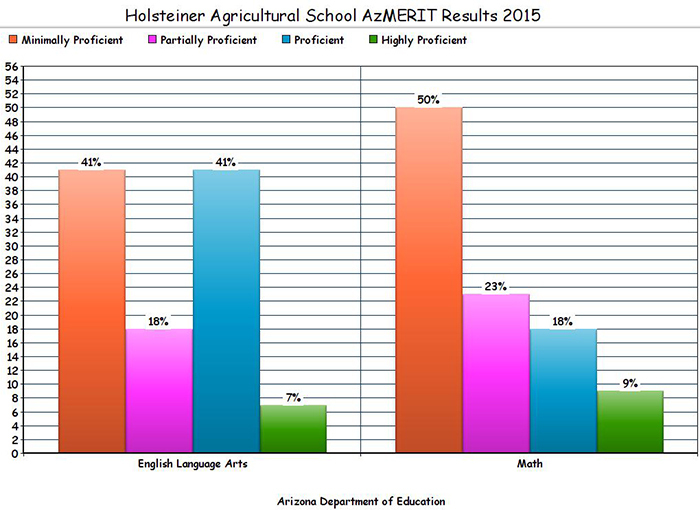 Holsteiner Ag School’s AzMERIT results: Red=Minimally Proficient; Pink=Partially Proficient; Blue=Proficient; Green=Highly Proficient. In math, 27 percent of the school’s students passed AzMERIT compared to 35 percent statewide. She said AzMERIT data is interpreted the same by small and big schools like. “We work with each student on their individual score and create an action plan based on their strengths and weaknesses,” she said. More than 40 percent of Holsteiner students who took the English language arts assessment passed it, better than the state’s 35 percent. Graysmark said there weren’t enough fourth, fifth or sixth grade students for scores to be reported. 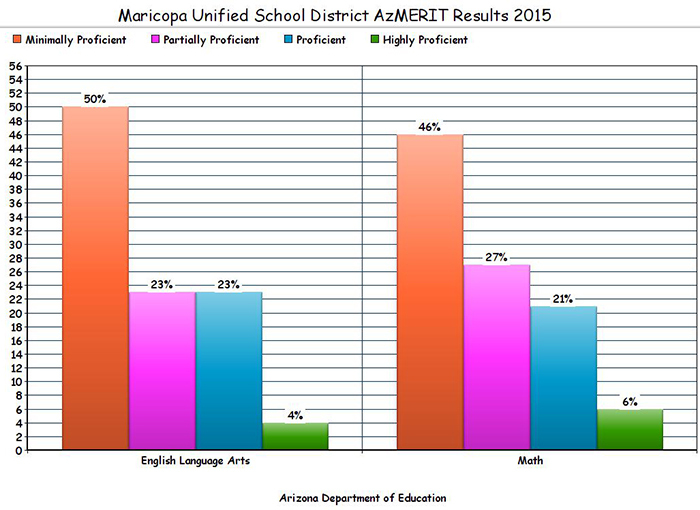 All Maricopa schools had bright spots on the AzMERIT and areas needing improvement. Chestnut said students who take AzMERIT may not all be college ready, but those who take ACT tests to submit to colleges do pretty well. 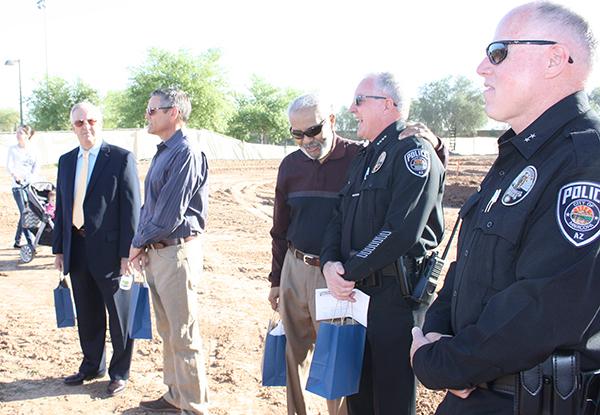 Leading Edge Academy in Maricopa hosted a ceremony to honor the city’s veterans Tuesday morning. Leading Edge welcomed veterans and public officials from the community to the school to partake in a ceremony and breakfast provided by the school. Maricopa Mayor Christian Price and Pinal County Sheriff Paul Babeu addressed the audience and thanked the community’s veterans for their service. Between the speeches, member of the Leading Edge Youth Choir and Percussion Band performed patriotic songs. Mayor Price, unlike the other featured speakers, did not serve in the military, but instead found his calling as a public servant. However, his message to the crowd was similar. The final speech came from Air Force Staff Sgt. Lily Gonzales. Her speech regarding what the American flag meant to her offered the crowd some history on the flag, but also outlined its importance to veterans and members of the military still serving. 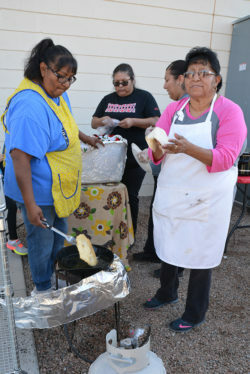 As the ceremony concluded, the students were ushered back to their classes and the veterans and parents were treated to a complimentary breakfast. 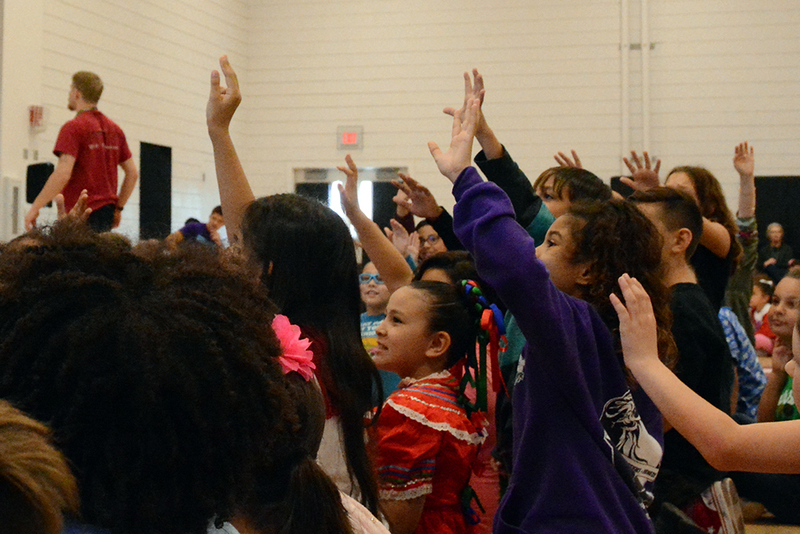 Leading Edge Academy Youth Choir rehearses for a Veterans Day program, planned for Nov. 10. Leading Edge Academy presents a special Veterans Day salute on Nov. 10. War veterans and local dignitaries have been invited. 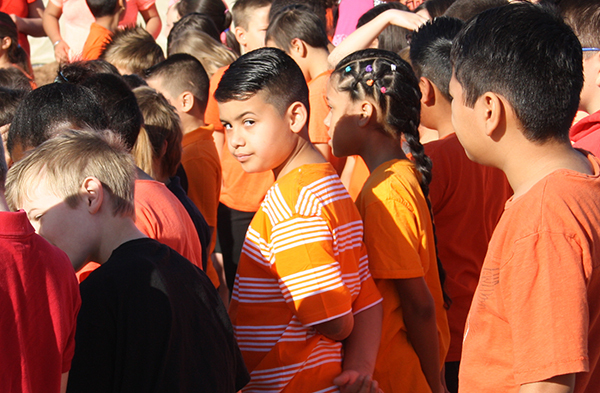 There will be assemblies at 9 a.m. and 9:30 a.m. Besides being treated to patriotic music, veterans and their families have been invited to breakfast. 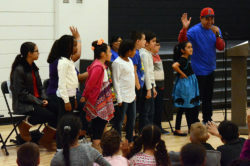 The Leading Edge Youth Choir consists of students in third through fifth grade, under the direction of Denise Frietas. “She does a phenomenal job and now we’re appearing in four or five functions with the city and everything else, so it’s been a very positive experience,” Reese said. Leading Edge Academy is at 18700 N. Porter Road. Call 520-568-7800.